Ever since my 4.5 year old daughter turned 3, I have had my eyes peeled for a ring for her. I have had no luck because all rings, both costume jewelry or sterling silver, are too large for her, even those meant for girls. Even adjustable rings at the smallest position do not fit. Well, it occurred to me the other day that perhaps an adjustable toe ring might work. Has anyone ever tried using one as a girls ring? I would love to hear about how it worked out for you. I saw this Sterling Silver Pink CZ Heart Toe Ring and think that it would make the perfect first ring for a little girl. It is priced at $18.99 and would make a very sweet birthday gift for when my daughter turns 5. If only I could be sure that it would fit . . . 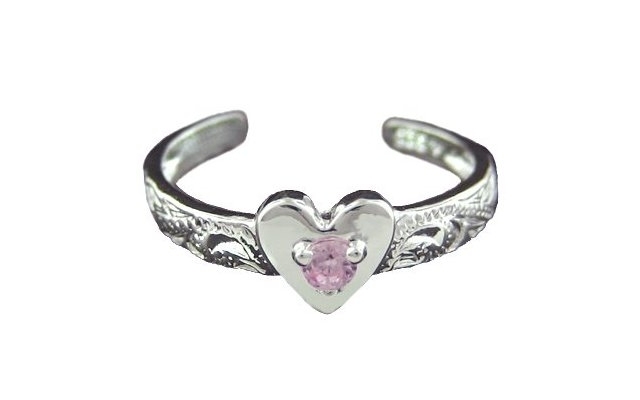 I suppose I will have to take her to a store that sells toe rings and try a few on her fingers before I order this one.